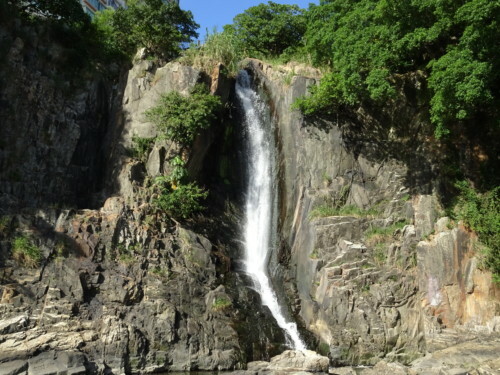 In this post I am going to introduce to you a waterfall located at the south west of Hong Kong at the Hong Kong island near cyberport. It is called the waterfall bay. Unlike an ordinary waterfall in the country side, it is next to a residential area of a public housing complex and a garden. This waterfall has some urban legends which is interested to visit. Because of it’s location where it is next to a public housing complex with people living closed by and walk pass the waterfall, there were accidents happened there of which kids were playing at the waterfall, fell into the water and drowned. Also in the past years, even adults have fell into the bottom of the waterfall by accident. 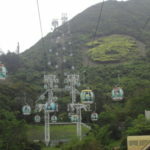 With all of the incidents happened, there were some supernatural rumors arisen and made the place mysterious. One of the rumor was about a group of kids playing at the waterfall and discovered a lady with long hair and wearing a long white dress washing her face at the bottom of the waterfall. They feel suspicious and try to approach her from the back. She looked back to them and the kids discovered that her face was blank without eyes, ears, nose and mouth. 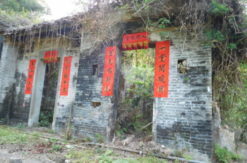 Another rumor was about the area around of the waterfall was actually a cemetery called “Kai Lung Wan East Cemetery” but was demolished and rebuild as the public house complex nearby and therefore those bodies without claimed by their families, their souls stay at that area around the waterfall. At the waterfall bay, not only the waterfall which you might be interested to visit, if you walk to the opposite direction of the waterfall along the shores towards the end of waterfall bay, there is a place called “Avenue of Statue”. The Avenue of Statue is a very unique place in Hong Kong, as the name is suggested, the place is full of statue which made it an avenue. 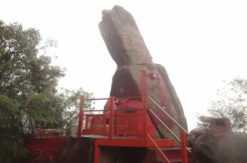 All of the statue are consists of local Chinese god statue which normally keep in the house for blessing of the family, however some of the people when they relocate to a new house, because of the limitation of space of the new house, they might abandon the statue at the Avenue of Statue. All of the statue are facing the sea, and with colorful painting on them. 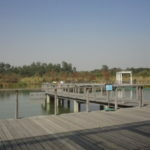 If you are not into supernatural rumors, the waterfall bay is actually a beautiful park which you could relax, take a walk along the shores and enjoy the sea view. If you look far away from the waterfall bay, there is an island at the other side of the sea called “Lamma Island” which is also a good place to visit during the holiday with the most noticeable and visible landmark of the island from waterfall bay is the 3 huge chimneys which is the power plant at the island. The waterfall bay also has barbecue facilities for family to enjoy a day of activity there.